"I am not handy. Just saying"
This is the text I sent a friend who I told I would help on a project to build a wheelchair ramp. I sent him the text as a reply to his solicitation of help. I did it for good reason, or at least I thought it was. You see, I feel that I'm not handy with woodwork, metalwork, plumbing, flooring and many of the other '-ing' words. This is an interesting perception of myself, and the more I do things, the more I find out that it's unfounded. Yesterday was again proof of that. I told my wife that part of my trepidation with offering help with projects such as these is the fear of messing up and having someone else have to fix it for me. Rather than have that happen, there's a part of me that would just rather not do it at all. So my first thought when these things come up is "Save face by not helping." Now that's a commandment from God I've never seen in any Bible, even the New Living Translation. Thankfully reason won out over doubt and I decided to help after all. It turns out this project was to rebuild a ramp that was too steep for a woman with Multiple Sclerosis who was living with her mother. I met her mom first and she told me her daughter was 42. The medications she was taking for pain caused her to sleep a lot, though she was able to come out and say hello and thank us later on in the afternoon. It was a touching moment and one that made the whole day worth it. Here's a complete stranger with a horrible disease that I never would have met if I had gone with my initial self-doubt. 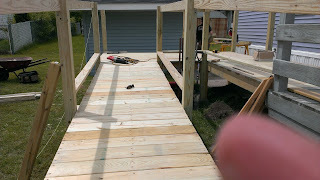 I learned a few things along the way as I worked on several different sections of the ramp. First of all, I had heard of a "Chalk Line" but always figured it was a drawn line telling where the studs were. Well it turns out it is a line of string That is heavily chalked that you hold both ends on and then "snap" down thereby leaving a line on which to center your nails. It was simplistic genius, and has probably been around forever. Another thing I learned is that "cheating" is allowed when working with wood. You cheat something left or right to compensate for the bowing, bending or warped wood. You never want to cheat too much (like real life :-) because it can come back to haunt. but it is allowed in isolated instances to correct or fudge. 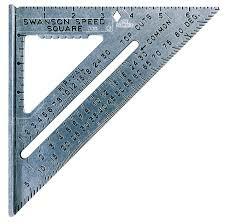 I learned a speed square is a triangle, not a square. From past deck-building and floor-building projects, I remembered that when using the chop-saw, you always want to check what angle is being cut. Yesterday we used 3 different angles (0, 4 and 45 degrees) and I managed to not botch a cut by checking the angle every time. I will admit though one time I lined up a 2X4 and thought to myself "Wow, how could I draw such a crooked line. Well, as it turns out the saw was set to 4 degrees, so my line only looked crooked. A funny moment in my day, nonetheless. Part of my apprehension in working with wood is my geometric disability. It's funny because I always loved geometry in High School, but when it comes to "seeing" and angle in 3D, I struggle. I eventually "get it," it just takes me 3 tries to visualize how it will come together. It's like a mathematical dyslexia of sorts. Don't judge me for it though. I also learned a few things about myself and life from the day. I discovered that I'm handier than I give myself credit for. I think back to the many projects I've either done myself or helped people with and realize that I'm plenty capable. It's was a Stuart Smalley revelation. ("I'm good enough, I'm smart enough...") I just need to keep powering through the self doubt that weaves itself ribbon-like through my being. It's like a cancer. Most importantly I realized how fortunate I am to be at this stage in my life, healthy, happy and able to help. The tables could have just as easily be turned and it could be my ramp that people were building for me. My brother had a makeshift ramp in his garage when he was paralyzed with his cancer, and I remember hating what it stood for. At the same time they allow the sick and suffering to get out and enjoy the world. They are a portal to the outside, the real life or the life they used to live, in some cases. In that sense the ramps are beautiful. Much of my life lately has been saying yes to things that are out of my comfort zone. In this case it was outside of what I feel is my expertise. Well thank goodness, I chose to say yes instead of no to this. I need to keep knocking down my own stiff-arm and plowing ahead. Great things happen and get revealed when I do, even if it means giving up a day of my own for someone else. And so having this new found understanding, as much as I gave on the day, I got a lot back as well.